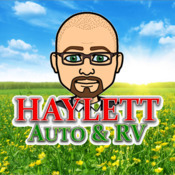 Since 1989 Haylett Auto & RV has been Clobbering Big City Prices in the wonderful small town of Coldwater, Michigan. Our Honor, Integrity, and Ethics in business have earned Haylett RV a sterling reputation that is demonstrated in our customer service, satisfaction, and loyalty. We do the work so that you can bring home the greatest quality and savings in the business.